However, the clearest (rural-urban) difference is found among low income households, with those living in rural areas being 70% more likely to have access to a car. This is symptomatic of a lack of alternative transport options. The report noted that in 2012 86% of households in rural towns and 49% of households in smaller rural settlements had access to a regular bus service which is an improvement on the position a decade earlier, though by 2012 (the latest year for this data) that upward trend had stalled. Over the last decade, another trend is that more buses now run on a commercial basis and fewer receive local authority funding support. Across non-metropolitan (or shire) areas that support was cut by 8% in the last financial year and by almost 25% over the last four years. Monitoring during 2015/16 identified 124 local bus services that were withdrawn altogether and 248 that were reduced or otherwise altered (this time across the whole of England). The largest cuts were in shire areas. In rural areas the number of passengers using local buses grew in the years prior to 2008/09. That number then stayed fairly constant for a few years, before declining somewhat by 2014/15. This reversal of the trend coincides with bus service reductions. 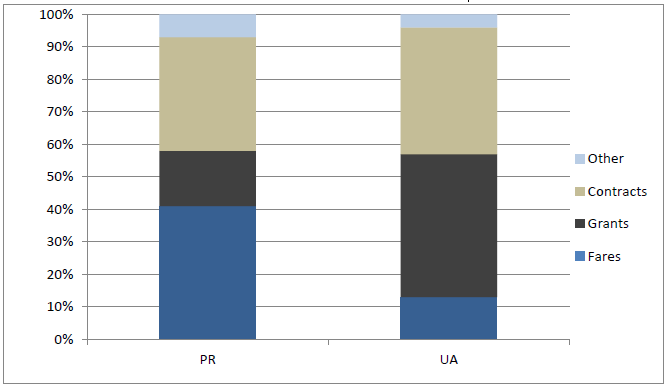 A similar pattern is evident for concessionary bus travel (mainly by pensioners). In this case the earlier growth and more recent decline is quite marked, probably due to expansion of the statutory concessionary fare scheme in 2008 and recent rises in the state pension age. Latest (2011/12) figures for community transport schemes show that a third of them operate in rural areas, where they carried 8 million passengers. However, schemes in rural areas tend to be small-scale, as well as being more dependent on fare revenue and less reliant on grants than urban schemes. The report has been researched and written for Rural England by Brian Wilson. The full report does contain some interesting evidence on the state of rural buses services, during the first part of this decade thanks, in particular to the Department for Transport statistics and the Campaign for Better Transport. But, the report acknowledges significant changes have taken place in the last couple of years 2015-16 due to local authority cutbacks that have not been appeared in the statistics as yet. It is disappointing that there has not been any reference to the Total Transport Pilot Projects funded by the Department for Transport that is looking into new models for local transport in rural and isolated areas. 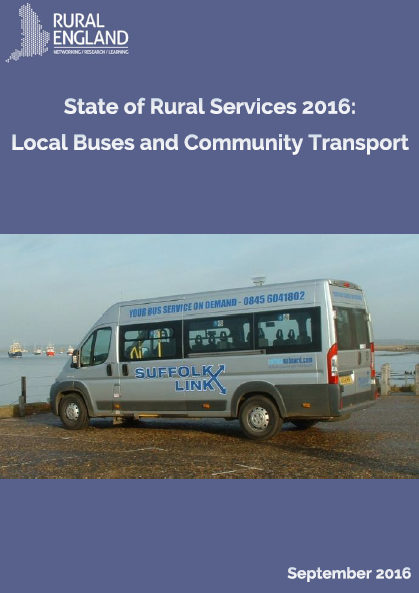 This includes developing bookable flexible on-demand mini-bus services (Demand Responsive Services) for ALL people not just disabled and infirm – like Suffolk Links (which is featured on the front cover of the report) – but now called “Connecting Communities”. The report also focuses on return journeys originating “out from a community” rather than “considering journeys into a community” – as with visitors (tourists) and its consequential economic impact on the local community. These inward journeys could increasingly form an important part of the “sustainable model” for rural public transport. This is particularly increasingly important with an aging population – who may be less willing to want to use their cars (for health or economic reasons) but are still active travellers. The increasing development of tourism from international visitors, who are less willing to want to hire a (right-hand side) car, also creates new opportunities for contributing to the “sustainable model” for rural transport – so long as there are integrated at transport interchanges with the railway network. Individualised Packaging of visitor experiences (public transport mode with accommodation and local visitor attractions/events is the next stage for developing the rural economy. But more about that later!! “Thanks for the blog and for your comments. You noted the Total Transport Pilot Projects. I’d agree that they ought to be broadly helpful. However, for the State of Rural Services report we decided early on not to list policies, but rather to focus the report on stats and trends. Doubtless people using the report will make reference to current policies and policy solutions, as you have done. Its aim is to inform and stimulate debate. 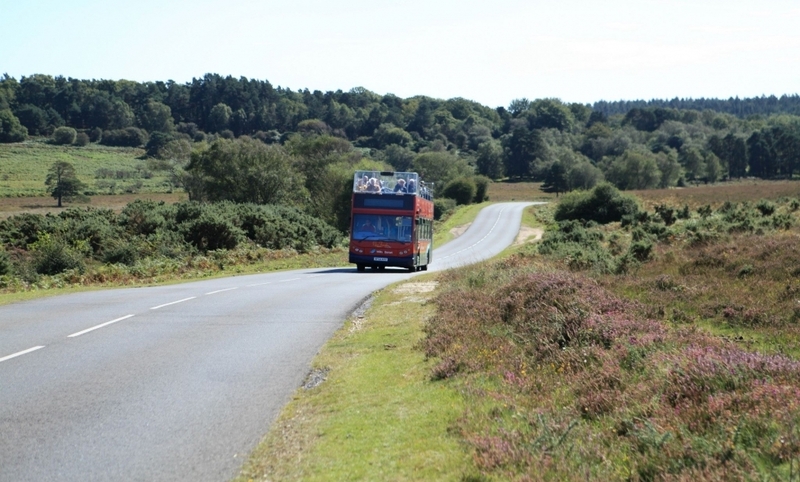 The New Forest Tour provides a unique open-top bus experience through the New Forest National Park – west of Southampton in Southern England. The hourly services will operate from 25 June to 11 September, 2016 with a choice of three routes: Red (the wild northwest), Green (the beautiful southeast) and Blue (the coastal southwest). From the top deck passengers will enjoy tree-top views of the National Park, with roaming animals, wide open heaths and ancient forest. Special audio commentaries tell the stories of the people and places of the New Forest – with characters, sounds and music bringing the view to life. 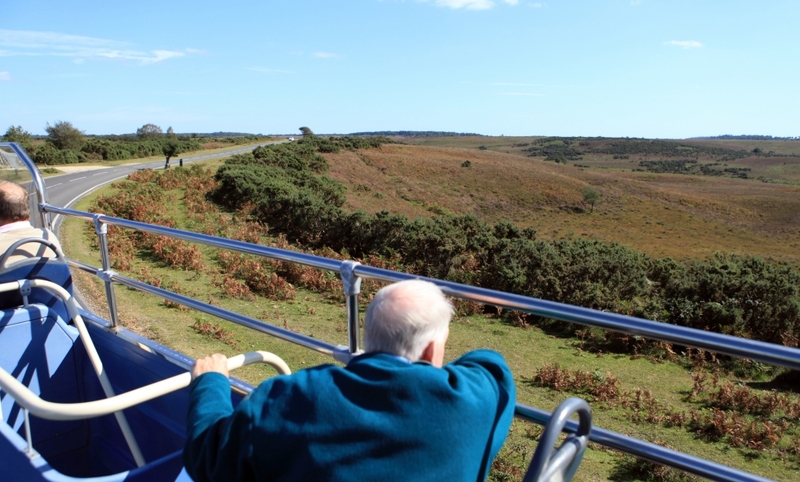 On the open-top Tours they get a bird’s eye view of the landscape and a better chance of spotting the beautiful animals of the New Forest – including deer and rare birds, pigs and donkeys, and of course the famous ponies. It’s possible to hop-on and hop-off anywhere along the route and catch another bus later on – or switch between Tour routes – all on the same ticket. People can also walk or cycle part of the way and then jump back on the Tour (up to four bikes carried free). There’s a great network of cycling and walking tracks. 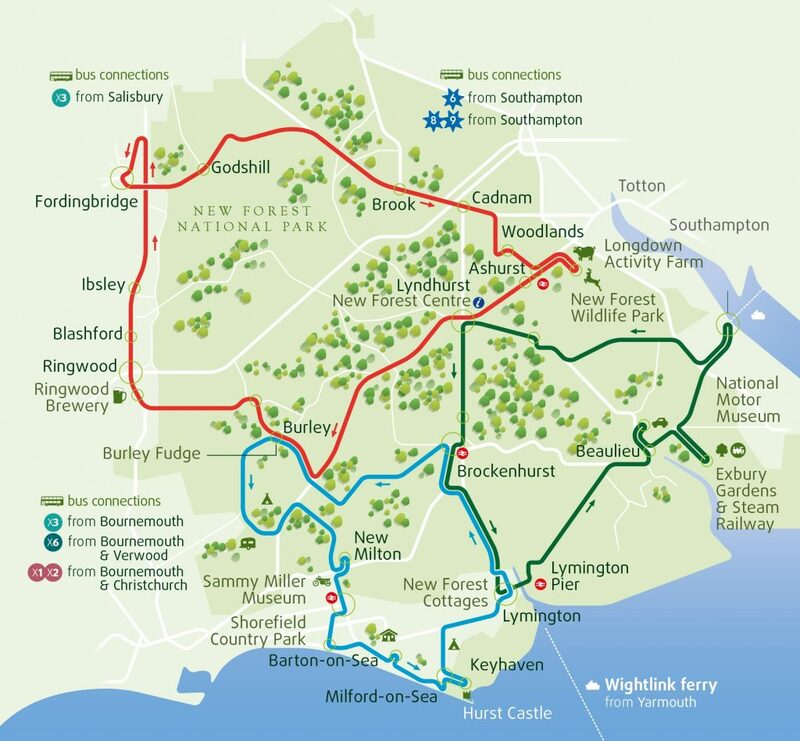 The New Forest Tour links to rail stations at Brockenhurst, Lymington Pier, Ashurst and New Milton, as well as the main bus connections in Lyndhurst, Brockenhurst, Lymington, New Milton, Ringwood, Fordingbridge, Ashurst and Hythe. The Tour also connects to Wightlink ferries to the Isle of Wight at Lymington Pier, services to Southampton at Hythe Ferry and the Hurst Castle Ferry at Keyhaven. It’s also easy to reach many of the Forestry Commission’s cycling and walking gravel tracks as well as hotels, campsites and B&Bs.